Forensic Science is the profession which serves the scientific needs of the justice system. The Forensic Science Undergraduate Program at UCF has been designed to provide the student with an educational background in the professional specialty of criminalistics and is within the department of Chemistry. The Analysis Track emphasizes the application of modern chromatographic, spectroscopic and micro-analytical techniques to problems in forensic science. The Biochemistry Track has a strong biochemistry-DNA focus to serve the needs of supervisory personnel in DNA sections of crime laboratories. The Ph.D. program in Biomedical is an interdisciplinary program that accommodates all aspects of Biomedical Science in the broadest sense of the term. The Digital Forensics MS degree is comprised of 30 hours of study beyond the bachelor’s degree with required, intensive specialization in topics related to digital forensics. The degree program prepare students, including working professionals, who will pursue a degree on a part-time basis to gain the knowledge and skills required to work as an examiner in the field. 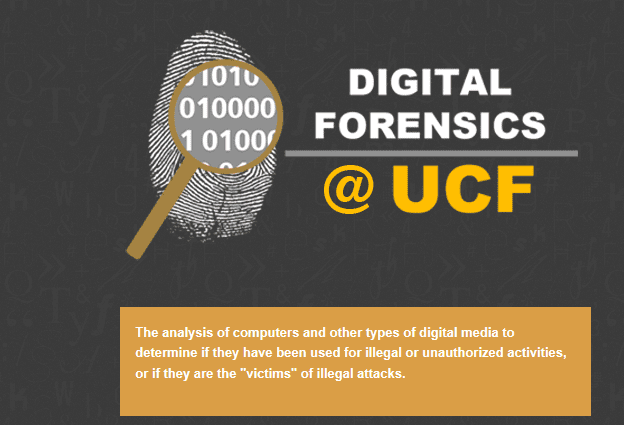 The MSDF degree is a collaborative effort between various UCF academic departments – Electrical Engineering and Computer Science, Forensic Science of Chemistry, Criminal Justice and Legal Studies – and the National Center for Forensic Science.